NEW two storey architecturally designed luxury beach house. The style is contemporary and clean, offering quality and comfort for your time away from home. 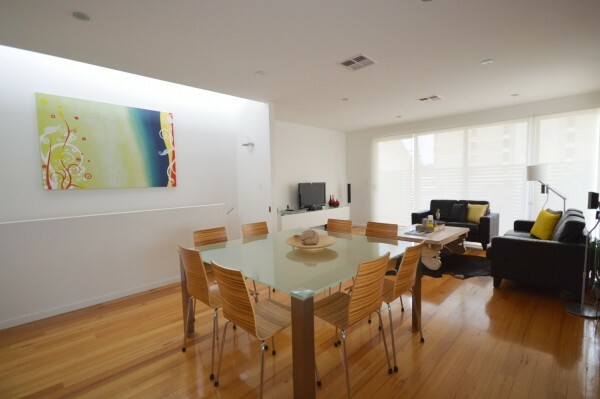 The house has modern art and quality furnishings. It features polished Tasmanian oak floors throughout, and Italian terrazzo tiles in the entrance and bathrooms. 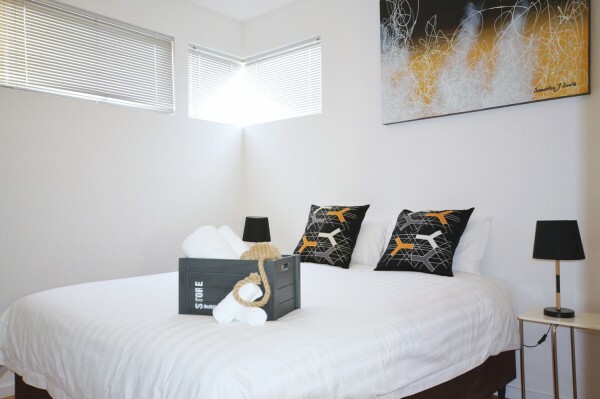 The house can accommodate 6 people in premium hotel quality beds, with an additional 2 people on up-market fold out beds. 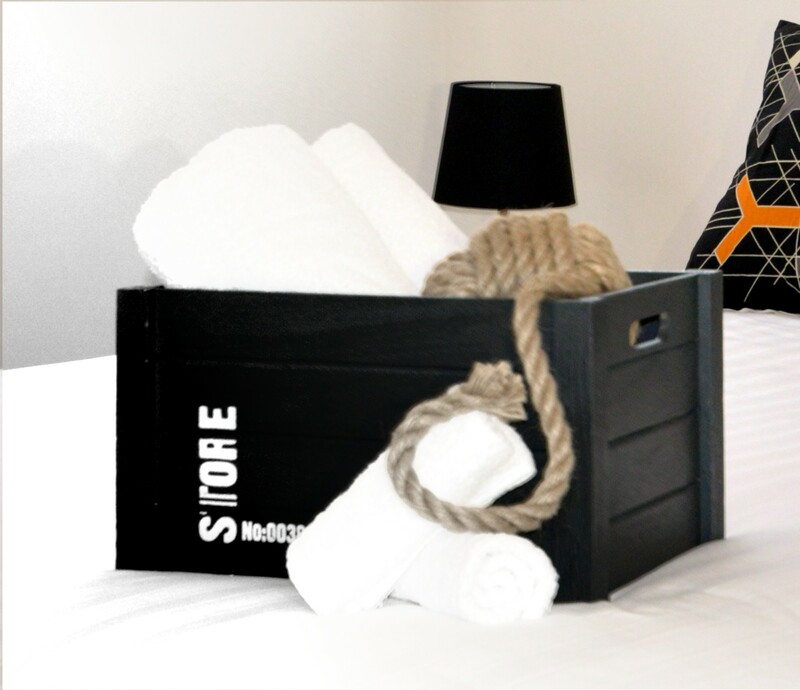 All bedrooms feature bedside tables and reading lamps, with ample hanging space for clothes. Beds are made with quality Sheridan linen. Upstairs, the spacious open plan living area comprises a full sized JAG designer kitchen, dinning area and lounge with home entertainment. 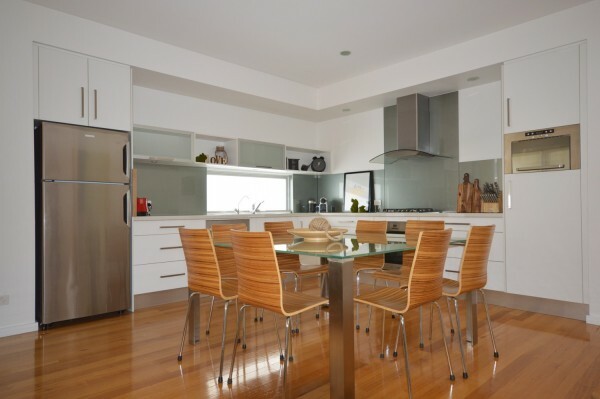 The well appointed JAG kitchen features quality stainless steel European appliances (including gas cook top, electric oven, large refrigerator, microwave and dishwasher), stone bench tops, high quality crockery, cutlery and kitchen utensils...excellent for passionate cooks and lovers of food. The 8 seat glass and chrome dining table with molded timber Italian designer chairs, overlooks the lounge area fitted out with leather lounges and antique Asian coffee table. The state-of-the-art entertainment system includes a LCD TV and Sony surround sound home theatre. 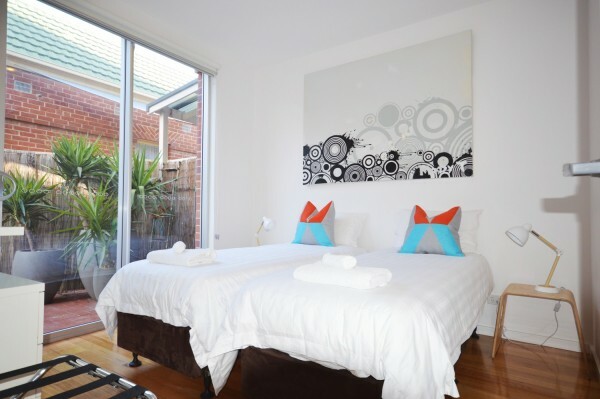 The upstairs also houses a double bedroom, full bathroom and laundry facilities. 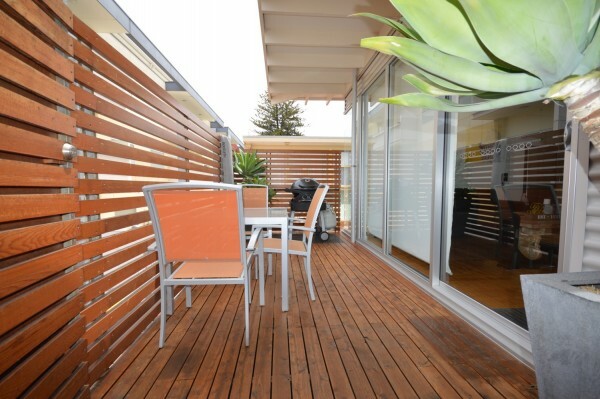 The upstairs living and dinning area opens onto a private deck, perfect for enjoying a coffee with the morning paper, soaking up a little sun, or even for a refreshing drink while enjoying the evening sea breeze and the buzz of Glenelg. The deck is equipped with an outdoor table and chairs, perfect for alfresco dinning. 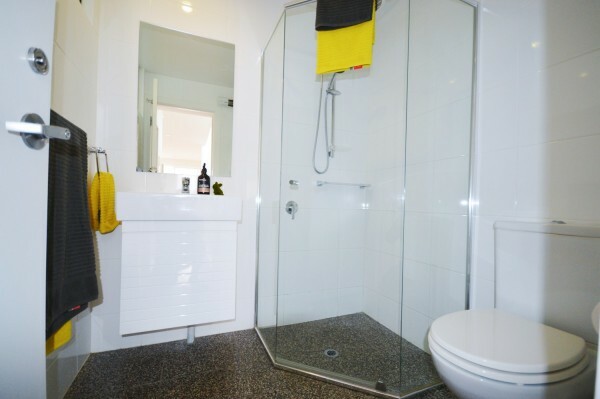 The bathrooms are stylishly and spacious, utilising quality Italian Terrazo tiles, sleek porcelain and chrome fittings with glass shower screens. The upstairs bathrooms has a shower, while the downstairs bathroom has a full bath with shower. The property has ducted reverse cycle air conditioning, broadband wireless internet, keyless entry with intercom and security alarm, in addition to water temperature controllers for each bathroom. 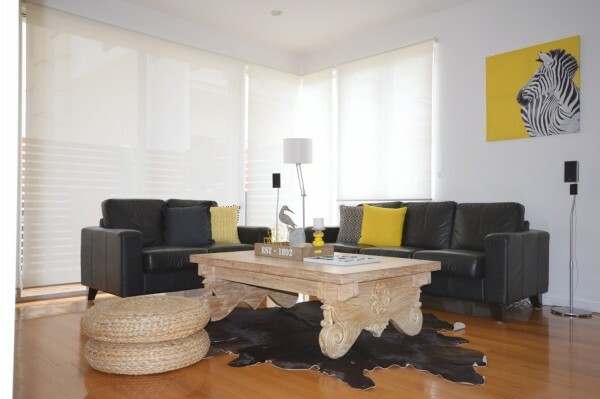 This property is ideal for short and long term stays, group bookings, and holiday or corporate. The house can accommodate between 2 and 6 people in luxury hotel beds, with an additional 2 people on quality fold out beds. Bedrooms can be configured to accommodate either queen or twin beds. The spacious master bedroom has a king size bed, while the other 2 bedrooms feature queens. Together with adjacent properties we can accommodate large group bookings. Accommodating 28 people in beds, with an additional 8 in fold out beds. The property is located on Sussex Street, only metres from cosmopolitan Jetty Road. The Jetty Road precinct boasts numerous award winning cafes and restaurants, with neighbouring retails outlets, cinemas, pubs and more. Everything you need is right on your doorstep in Glenelg. Take a short stroll to Glenelg’s popular sandy beach, or head along the foreshore to Holdfast Shores Marina for more shopping, food and fun. For further retail therapy, then head to Harbour Town (where quality brands sell direct), located next door to Adelaide’s new international airport, is only a short drive away. Hop on a Jetty Road tram, which run regularly and take you directly into Adelaide’s CBD, to visit more of Adelaide premier shopping and tourist attractions.